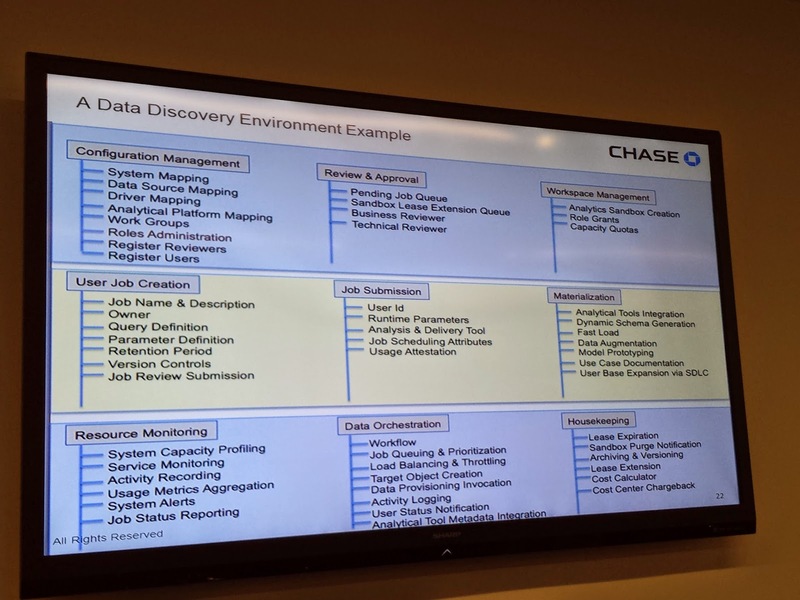 I'm live blogging this morning from today's TDWI NYC event on Game Changing Data Management, in which Emil Werr of JP Morgan Chase is giving the keynote. His focus is on a new the challenges--and the opportunities--of integrating new data sources (so-called Big Data such as clickstream data, voice of customer data capture, massive transaction data, real-time feeds, etc.). On Giving Users Earlier Access to Data While Avoiding Risk of Misuse: "let users have access to data, and let them create new analysis of that data, but require technical review before the analysis is used"
#tdwinyc part of governance: all requests for data come through a broker. All requests are tracked. Job Design / Competencies: These change a lot when you shift to a more self-service -oriented data discovery environment. As you adjust, the function becomes more mature and efficient. The demand for “business insight through analytics” is accelerating. Exploding data volumes, and integration and usability complexity impede timely and accurate delivery of those insights. Aggressive technology and process innovation is required to keep pace. Join the Chief Architect for Data Management & Analytics at JPMorgan Chase, and an illustrious panel of Technology Executives to learn how the Business Intelligence and Data Management profession plans to respond. Emil Werr - Chief Architect for Data Management & Analytics, and Managing Director at JPMorgan Chase, where he spearheads the data management and analytics transformation program, driving innovation and self-service analytics. Emil has multiple patents pending in data integration and workflow, and has received several awards in technology innovation, and agile information delivery.